Abigail Anderson, part of our Education and Community Program team an the Walker, remarked yesterday “turns out zen is kinda hard”. Help is on the way! 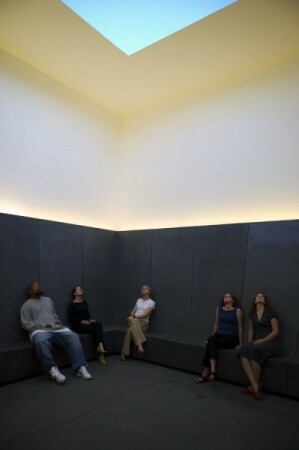 This Saturday the Experimental Meditation Center of Los Angeles, led by artists and performer Adam Overton, takes up temporary residence in the Walker’s James Turrell Sky Pesher for sessions at 1 and 4 pm. The sessions are free and open to the public. Experimental Meditation Center of Los Angeles is a frame[work], a magic circle, a safe space, a temporary autonomous zone, a performance space, … for the facilitation of artist-led meditations. Their definition of meditation is loose, areligious, and open to many gentle forms. They believe that the notion of “experimental meditation” is redundant, in that all meditation is an experiment in shifting our perceptions. experimental meditations at EMCLA are often facilitated through some form of focused activity, engaged in by groups or individuals, in a variety of physical and non-physical locations. They approach each meditation with humility and the wisdom that its ultimate social and aesthetic purpose needn’t always be understood immediately, or ever. Activities at EMCLA differ from session to session, each featuring new artist-facilitators and practices. they favor the playful, the experimental, and the temporary over the fanatical, dogmatic, and proselytic, gentleness over violence or aggressiveness, and seek to reinforce the magical and connective undertakings we artists are already engaging with on a daily basis. The Experimental Meditation Center of Los Angeles has no center, these days it often convenes at the home of Adam Overton, but for this Saturday it lands on the Walker Open Field. Adam Overton is an artist, composer and performer of experimental action and music, a teacher of various subjects, and massage therapist based in Los Angeles. Adam is also a member of the Los Angeles based collective Machine Project, who will be taking up residency on the Open Field July 19th – 29th. Mark you calendars for two weeks of performances, workshops and surprises throughout the campus. Here is a sample of a past piece: 30 meditations in 30 minutes, shouted.